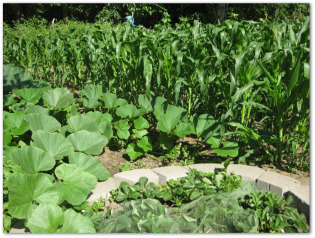 How to plant corn in your backyard vegetable garden. 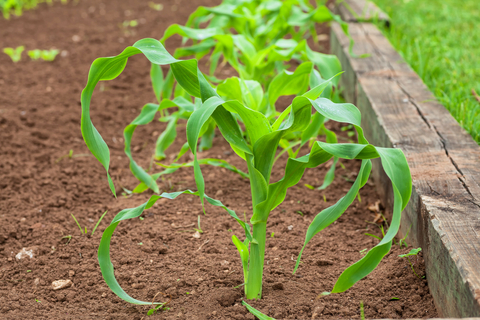 Easy tips for planting, growing, and caring for sweet corn plants in home vegetable gardens. We have some classic favorite varieties suggestions from the sweet corn patch to start you off on the right path on how to grow corn. For cold-resistant corn, an open-pollinated cultivar Fisher's Earliest is said to survive temperatures as low as 23 degrees F.
the other end of the thermometer, a hot climate producer Breeders Choice is picked for performance and flavor under hot conditions. A dried cornmeal variety Bloody Butcher is red and grows about 15 feet tall, even in Massachusetts! * Root disturbance and lack of nutrients can both hamper your corn crop. * If direct seeding into the garden, wait until all danger of frost is past and the soil warms up to 60 degrees F. Spread plastic on the planting area to speed ground warming. * Planting corn from transplants in not recommended, as the fragile root system likely won't survive being moved. * For early plantings, sow seeds 1 inch deep. In hotter weather of midsummer, sow 4 inches deep. 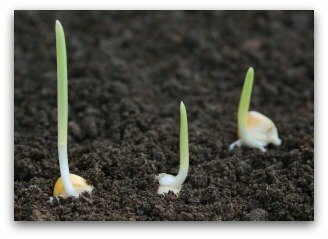 * Cultivate thoroughly around the stalks for the first month of growth. Afterward, control weeds by applying mulch to avoid damaging the shallow roots. * To prevent cross-pollination keep different corn cultivars separated or plant so they tassel two weeks apart. * To promote pollination, plant the same cultivar in blocks or hand-pollinate. * Corn is a heavy feeder, especially on nitrogen. It thrives where earth-enriching crops like clover or beans grew the previous year. * Three weeks after corn silks appear, pull back part of the husk and pierce a kernel with your thumbnail. If milk spurts out, the sweet corn is ready for harvest. A completely dry silk, yellow, or faded green sheath means the ear is past its prime for picking. Growing sweet corn in the home vegetable garden requires a considerable amount of space. You may experience the disappointment of poorly filled or worm-ridden ears as you learn how to plant corn. Despite the crop's finicky nature, the delicious homegrown taste is well worth the extra effort. 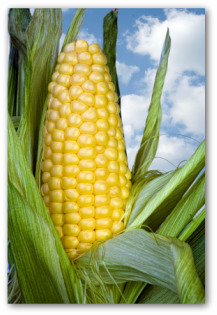 Corn needs tender, loving care all through its growth. The cells that become an ear of corn form when the plant is just a few inches high and any stress during growing alters the end product. Give your corn plenty of space. Rows should be at least 32-36 inches apart. Plant spacing in the row should be 9 inches at minimum. At planting, put down a balanced fertilizer that provides the equivalent of 50 pounds of nitrogen per acre. For example, with commercial organic fertilizers such as soybean or cottonseed meal containing about 6 percent nitrogen, you would need to apply slightly less than 2 pounds of fertilizer per 100 square feet. 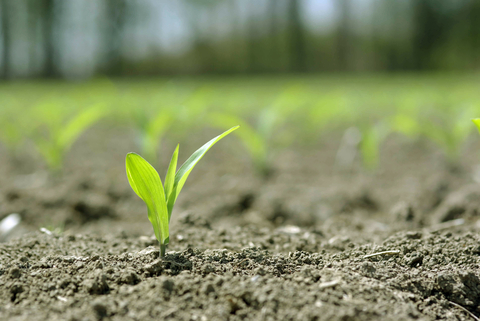 Side-dressings can be applied when the corn is 6 inches tall by sprinkling nitrogen fertilizer in a shallow trench about 6 inches to one side of each row. Water corn plants when necessary. Growing corn plants need at least one inch of water every week. If rainfall is inadequate, give the soil a good soaking. Don't water from above if possible, because watering overhead can wash pollen off of the tassels. Now that you know how to plant corn, the next step is how to tell when your corn is ready for harvest! 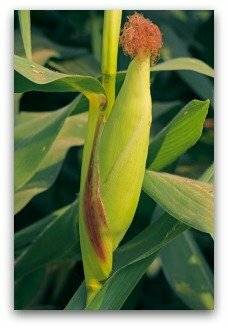 The first sign that the corn is nearly ripe, is seeing the corn silk at the tip of each ear of corn dry and turn brown. It's ok to peek at the tips of the growing ears of corn to determine if they are ripe. With some experience, you will usually be able to tell if they are ripe by looking at the size and shape of the ear, and gently feeling the outside of the ear of corn for plump kernels within. Pick the ears of corn by pulling them slightly away from the corn stalk, and giving them a twist. For the most sweet and delicious results, corn should go straight from the garden and into a kettle of simmering water. 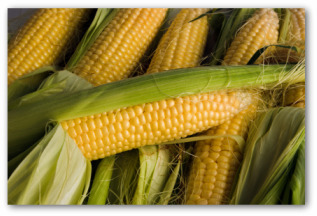 The corn sugars begin to turn into starch immediately after picking, so it is important to cook, can, or freeze corn immediately after it is picked. After husking corn and removing most of the silks, capture the stubborn ones with a damp cloth. Rub the cloth down the ear, from tip to base, to pick up the leftover silks.